What a great weekend! Despite the vagaries of a Scottish ‘summer’ – which is basically autumn with added midges and tennis – my family and I had an idyllic Saturday and Sunday. A perfect mix of socialising and doing bother all. Humour me for a few minutes while I elucidate. Every year we host a big barbecue, with work colleagues, family of colleagues and Mr A’s fellow Maggies Monster Bike and Hikers in attendance. I buy decent sausages and fish, and make homemade burgers, salads and maybe a fruity pavlova or two. But it’s really about the mildly alcohol-enhanced chat (Scottish stereotype intact), daft games involving malted milk balls and water guns, and treating our tolerant neighbours to my daughter’s frankly awesome taste in tunes. The past few times Mr A and his partner in all things childish, Issy, have taken to scouring the charity shops for the most dire, embarrassing and ill-fitting hats and garments to inflict on our game partygoers: every balding man has to have an Abba wig and at least someone has to sport superhero underpants over their trousers (hello Gordon!). But every year there is the fret about what the weather might unleash. So, every year a marquee gets erected in the garden to act as a weather charm, warding off looming thunderheads that tend to gather like snarling dogs. Do you do that too? Not set up marquees but, say, drag an umbrella around so that you won’t need it: it always rains if I don’t have one rather than when I do. I practise a lot of rain god appeasing here in Edinburgh. But, despite an almighty downpour of rainforest proportion at T minus 2 hours, we ended up dancing, singing, gossiping, marshmallow toasting and chowing without the downer of raincoats and wellies. All under under our nearly-midnight sun. Bliss. And to top it all off from two very thoughtful friends came the gift of little coats for our rescue hens. So even our girls could join in the dress up ‘fun’. We tried one on our most amiable (ie, daft) girl and it fitted perfectly. She wasn’t too sure about it, but I bet she will be clucking for it before too long. 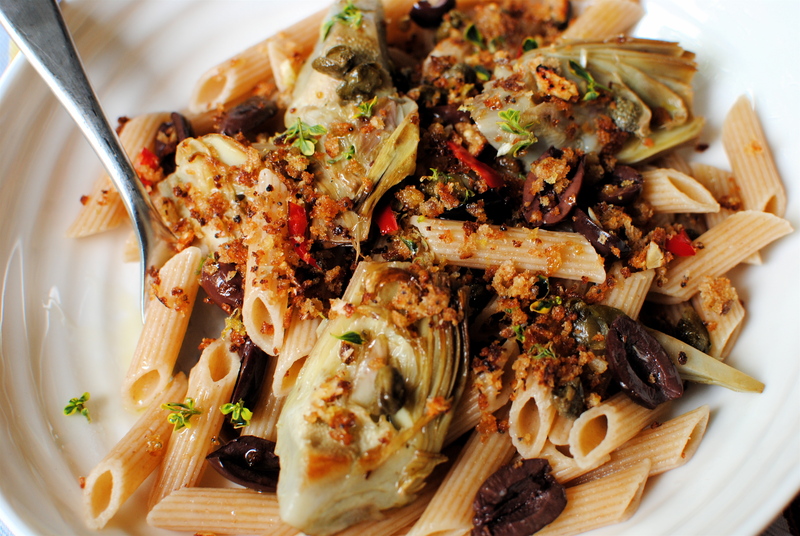 #This week’s recipe is a simple one, but requires a little patience with the artichokes. You can of course buy grilled artichoke hearts in oil from any decent deli, but it’s so much more satisfying to let them keep their premium priced imports and do a little diy. Don’t worry, I won’t ask you to brine your own olives. When I was young my mother would spend a small fortune buying the then-exotic edible thistles. I was always amazed that she could transform the prickly forbidding globes into lemon and butter soaked miracles of deliciousness. I clearly remember gorging myself on them past even the point of simple greed. Dragging the soft grey-green flesh through my newly grown in ‘big girl teeth’ was an unspoken pleasure of summer. These days, mindful that it’s my own money I’m spending, I eat them in the context of a meal rather than as the meal. That’s where this recipe comes in. It is quite simply my favourite recipe for these pretty little sculptural vegetables. I make it a little different every time but this is probably the simplest. As always, freestyle with complementary additions, perhaps some herb-spiked feta or garlic-sauteed shrimps. History & Nutrition Bit: Globe artichokes, or Cynara cardunculus if you want to be precise, is basically a big, edible thistle. How the ancients thought that something this beautiful but forbidding looking would have any culinary promise is beyond me. A testament perhaps to their imagination, or level of starvation. But many of us are glad that they saw beyond the tough, leathery leaves to the glorious tender heart. Scholars believe that globe artichokes were first cultivated in Italy, although archaelogical evidence shows they originated in Egypt. Initially used as an exclusive sweet tidbit of alleged aphrodisiacal repute, it is now eaten more widely as a still-exclusive treat, albeit tending towards the savoury. Most of the commercially available produce is grown in California, Italy, Spain and France, but the many hybrids around make it easy enough for many of us to grow them in our own gardens. At a local allotment here in Edinburgh, magnificent specimens stand bold and brave against the keen North wind. The thistle is, after all, Scotland’s national flower so I guess it is reasonable that an edible relative should thrive here. As far as nutritional properties, the liver-supporting compound cynara in globe artichokes is highly prized for use as a hang-over remedy. But this compound has wider medical usage as an anticholesterolemic and hypoglycaemic, and in helping relieve the symptoms of irritable bowel syndrome. Although pregnant women and those with liver cancer are advised to avoid globe artichoke leaf extract culinary use of globe artichokes is absolutely fine unless told otherwise. 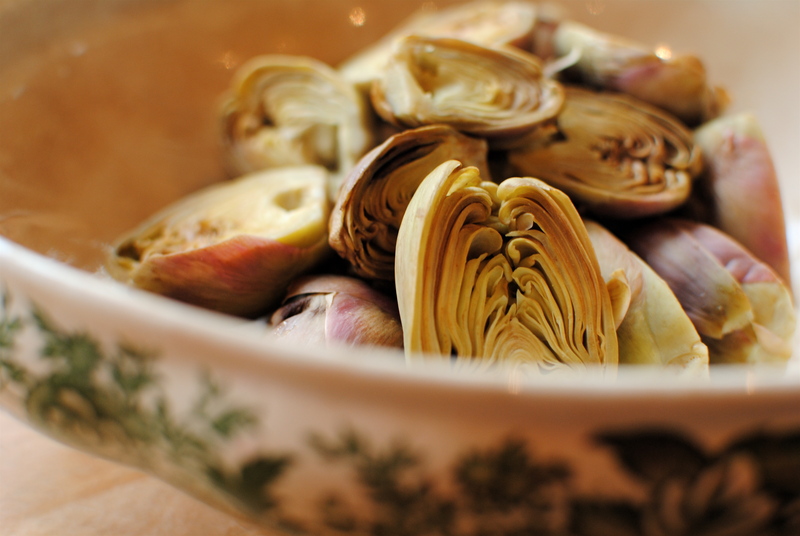 Globe artichokes are also sources of folate, Vitamins B3, B5, potassium, manganese, biotin and zinc. The relatively high amounts of B vitamins in the globe artichoke can potentially help with energy and alertness – all helpful when undergoing treatment for cancer. First of all, let’s tackle the globe artichokes. I defer to the late, great Marcella Hazan for advice on most things Italian, and artichoke prep is no exception. Her “The Classic Italian Cook Book,” with its ever so slightly snide remarks about British and American shopping, cooking and eating habits is a great favourite of mine for its clear and amusing instructions. Highly recommended. Before setting to with the artichokes get a bowl and fill it with water and the juice of one lemon. Into this acidulated bath you will place each trimmed and prepared artichoke. Now, hold one artichoke by its stem and begin gently snapping off the outer dark leaves. As you work deeper into the artichoke the leaves will snap off further from the centre until you reveal a central cone with pale leaves, only tipped with green. My mother used scissors and you may also like to do so. Depending on the size of your artichoke you may have to remove an alarming amount of leaves. It is worth being fairly ruthless as keeping too many unsuitable leaves will ruin an otherwise lovely artichoke. I speak from experience: no amount of boiling and sautéing will make tough leaves anything but cooked and tough. Hazan asks us to snap off the leaves midway down rather than all the way off, but I find artichokes too variable to get away with this. Once you have a pale cone slice about an inch off the top, or enough to get rid of the remaining green. Now slice the artichoke in half lengthways, splitting the stem. 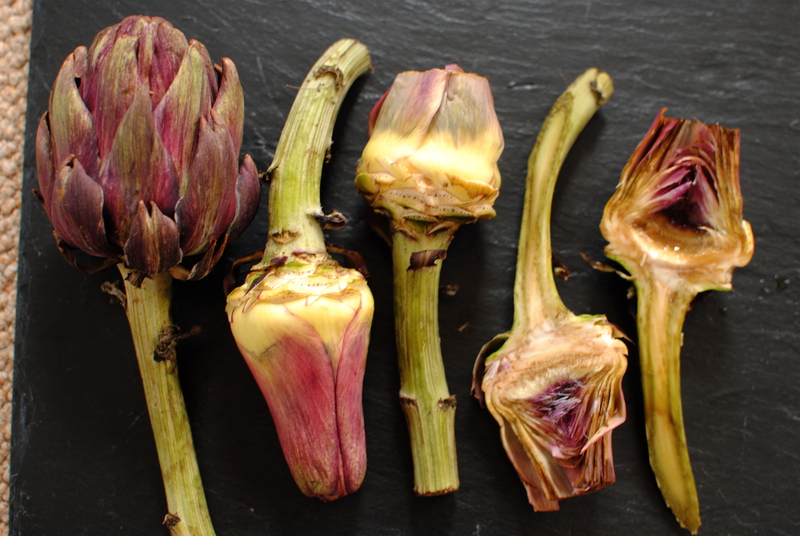 Working quickly, use a short paring knife to remove the inner pale leaves that curve inward as well as any surrounding purple prickly ‘hair’ that curves into the very heart of the artichoke – this is the choke itself. The prized heart holds these prickly hairs so be careful not to go too far. Cut away most of the stem too. 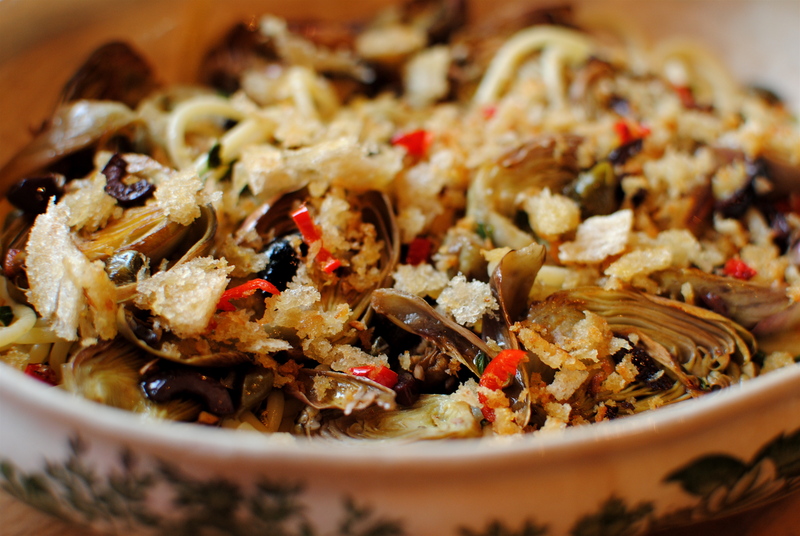 In recipes where the artichoke is all chopped up the skinned stem is included. You can now pop your artichoke into the waiting lemon water and continue with the remaining vegetables. Once you’ve done one you will quickly work through the rest. I promise. When all artichokes are prepared bring a pan of water to the boil and slide the artichokes in, simmering for 15-25 minutes. Sorry to be so inexact but the timings depend on the age and size of the artichokes. If they are especially brobdingnagian you may need to cook for even longer. You will know they are done when you can easily pull away an inner leaf. Drain and lay on a paper towel for now. That tricky bit over with, whiz up the breadcrumbs in a food processor and tip them into a hot sauté pan to which you have added 1 tablespoon of olive oil. Let the crumbs sizzle and darken slightly, stirring frequently. Sprinkle in the lemon zest and chilli slices and continue for one more minute before decanting onto a plate. Set aside. 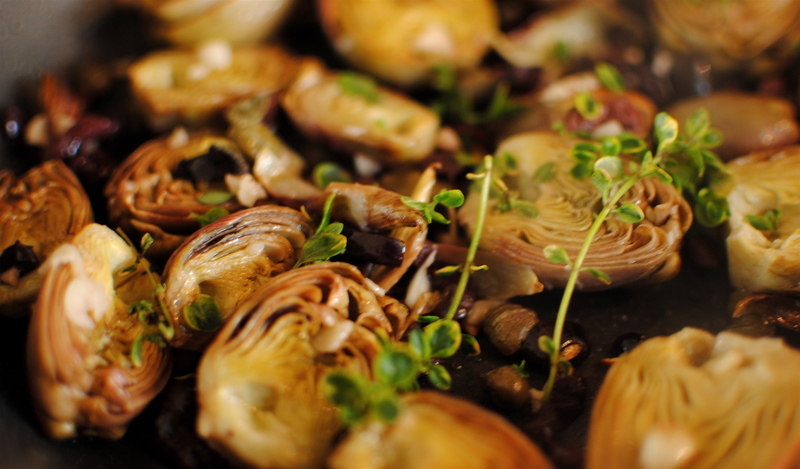 Heat the remaining oil and when hot add in the capers, garlic, lemon thyme leaves, olives and artichokes. Let everything saute for about five minutes, stirring frequently. While this is sizzling away and smelling nice, cook your pasta, shaving off a minute to keep it firm. When the pasta is done, drain well, dress with more oil (as you like but use your best stuff here), pour over the remaining lemon juice and mix this into the sauté pan with the vegetables. 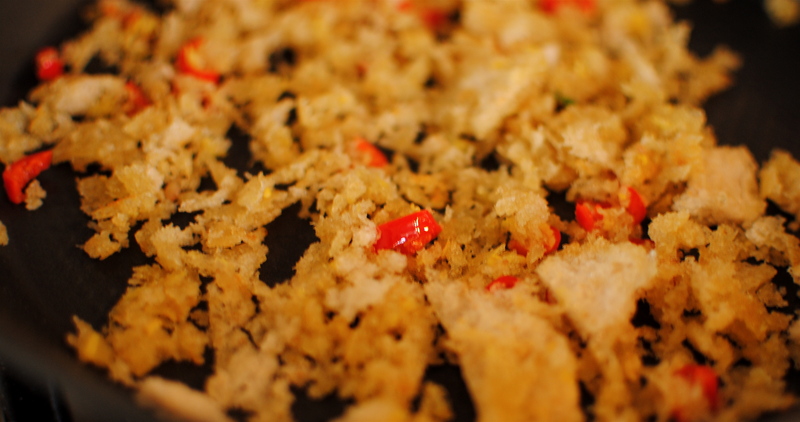 Mix and season to taste before plating up with a small handful of crispy spicy crumbs on each serving. If you really get on well with this artichoke prep lark you may like to do a larger batch. With extras you can keep them in herby olive oil, or hollow out, boil and stuff whole ones with breadcrumbs, Parmesan, minced garlic and parsley for baking in a moderate oven. You will think of many options. 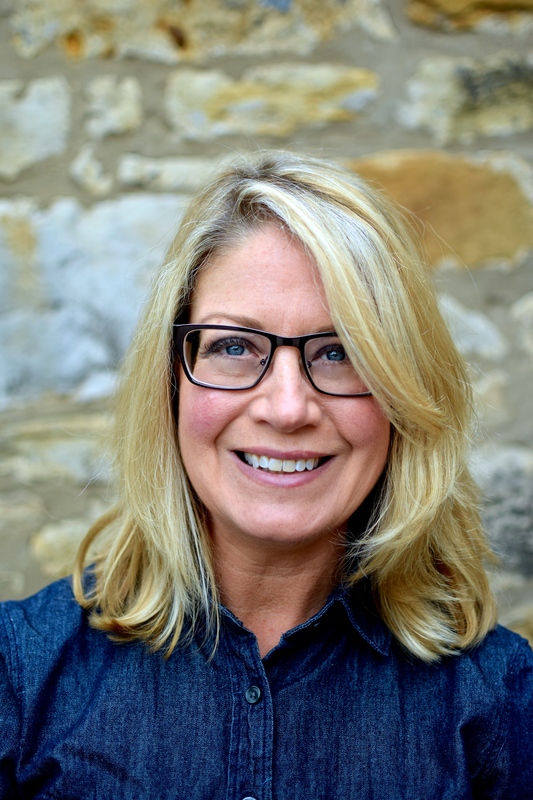 Another delicious recipe Kellie! I enjoyed the BBQ story very much as well. 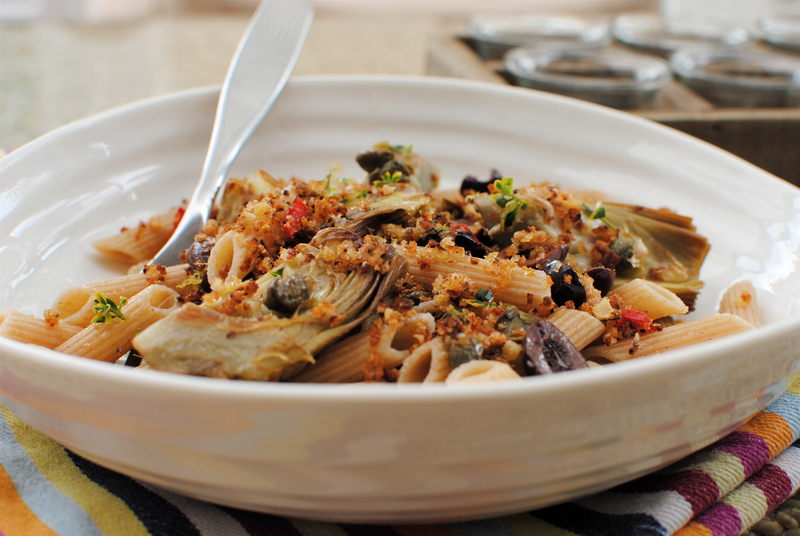 Hi Kellie – made this for dinner tonight and it was yum but I did struggle with the artichokes and had to add some emergency jar ones! They’re tricky little blighters and I think I need a bit more practice to prepare them!! Very tasty in the end though – thank you. They can be a bit fiddly so it’s not a cop-out to buy jarred ones. Long-stemmed ones are pretty in a vase though! Glad the recipe worked out in the end. Wow! You really like Parmesan! Great article and photographs. Thanks so much for sharing. I like ‘how tos’ and ‘whys’ and that article fit the bill. As a body builder do you look at hivehealthmedia? I have started writing for them and their founder is a body builder too so you may like their stuff. It sounds like a fantastic time! I’ve saved this recipe. I’m a big artichoke fan, but we typically only have the big globe type available. We do have frozen artichokes that look like they might work in a way. What do you think? I would use the big guys if they are cheap as they are actually tastier than the little ‘uns, in my opinion. Conversely they are more tender. Wondering if defrosted ones a little mushy? Never used them so I don’t know. If you use the frozen ones, let me know how it went. Thanks for stopping by Kristi. HOpe you are having a fabulous summer.